For the volcano in the Aleutian Islands, see Pogromni Volcano. A pogrom is a violent riot aimed at the massacre or persecution of an ethnic or religious group, particularly one aimed at Jews. The term originally entered the English language in order to describe 19th and 20th century attacks on Jews in the Russian Empire (mostly within the Pale of Settlement, what would become Ukraine and Belarus). Similar attacks against Jews at other times and places also became retrospectively known as pogroms. The word is now also sometimes used to describe publicly sanctioned purgative attacks against non-Jewish ethnic or religious groups. First recorded in 1882, the Russian word pogrom (погро́м, pronounced [pɐˈgrom]) is a noun derived from the verb gromit' (громи́ть, pronounced [grɐˈmʲitʲ]) meaning "to destroy, to wreak havoc, to demolish violently". Its literal translation is "to harm". The noun pogrom, which has a relatively short history, is used in English and many other languages as a loanword, possibly borrowed via Yiddish (where the word takes the form פאָגראָם). Its widespread circulation in today's world began with the anti-Semitic excesses in the Russian Empire in 1881–1883. The Hep-Hep riots in Frankfurt, 1819. On the left, two peasant women are assaulting a Jewish man with pitchfork and broom. On the right, a man wearing spectacles, tails and a six-button waistcoat, "perhaps a pharmacist or a schoolteacher," holds another Jewish man by the throat and is about to club him with a truncheon. The houses are being looted. A contemporary engraving by Johann Michael Voltz. 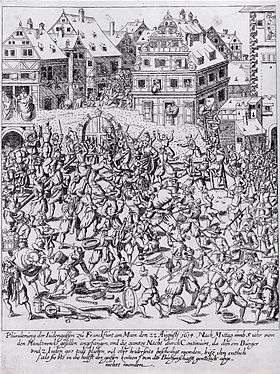 The anti-Jewish riots took place in Europe already in the Middle Ages. The Jewish communities were targeted in the Black Death Jewish persecutions of 1348–1350, in Toulon in 1348, in Barcelona and in other Catalan cities, during the Erfurt massacre (1349), the Basel massacre, massacres in Aragon, and in Flanders, as well as the "Valentine's Day" Strasbourg pogrom of 1349. Some 510 Jewish communities were destroyed in this period, extending further to the Brussels massacre of 1370. On Holy Saturday of 1389, a pogrom began in Prague that led to the burning of the Jewish quarter, the killing of many Jews, and the suicide of many Jews trapped in the main synagogue; the number of dead was estimated at 400–500 men, women, and children. The first atrocities against Jewish civilians, on a genocidal scale of destruction, were committed during the Khmelnytsky Pogroms of 1648–1657 in present-day Ukraine. The precise number of dead is not known, although it is estimated that about 20 percent of Jews of the entire region were killed. Modern historians give estimates of the scale of the murders by Khmelnytsky's Cossacks ranging between 40,000 and 100,000 men, women and children, or perhaps many more. The Russian Empire, which previously had very few Jews, acquired territories with the large Jewish populations during the military Partitions of the Polish–Lithuanian Commonwealth in 1791, 1793, and 1795 conducted jointly with the Austrian and Prussian armies, and resulting in Poland's elimination from the geopolitical map of Europe for the next 123 years. In conquered territories, a new political entity called Pale of Settlement was formed in 1791 by Catherine the Great. Most Jewish people from the former Commonwealth were only allowed to reside within the Pale, including families expelled by royal decree from St. Petersburg, Moscow, and other big Russian cites. The 1821 Odessa pogroms marked the beginning of the 19th century pogroms in Tsarist Russia; there were four more such pogroms in Odessa before the end of the century. Following the assassination of Alexander II in 1881 by Narodnaya Volya – blamed on the Jews by the Russian government, anti-Jewish events turned into a wave of over 200 pogroms by their modern definition, which lasted for several years. Jewish self-governing Kehilla was abolished by Tsar Nicholas I in 1844. The first, in the 20th century Russia, was the Kishinev pogrom of 1903 in which 47 Jews were killed, hundreds wounded, 700 homes destroyed and 600 businesses pillaged. It was followed by the Kiev pogrom of October 1905, resulting in a massacre of approximately 100 Jews. However, at about the same time, the Jewish Labour Bund began organizing armed self-defence units ready to shoot, and the pogroms subsided for a number of years. According to professor Colin Tatz, between 1881 and 1920, there were 1,326 pogroms in Ukraine (see: Southwestern Krai parts of the Pale) which took the lives of 70,000 to 250,000 civilian Jews, leaving half a million homeless. Large-scale pogroms, which began in the Russian Empire several decades earlier, intensified during the period of the Russian Civil War and the Revolution of 1917. Professor Zvi Gitelman (A Century of Ambivalence) estimated that only in 1918–1919 over 1,200 pogroms took place in Ukraine thus amounting to a greatest slaughter of Jews in Eastern Europe since 1648. Aleksandr Solzhenitsyn in his book Two Hundred Years Together, provided additional statistics from research into the pogroms in Ukraine, conducted by Nahum Gergel (1887–1931). Gergel counted 1,236 incidents of anti-Jewish violence and estimated that 887 mass pogroms occurred – the remainder being classified as "excesses" not assuming mass proportions. The Kiev pogroms of 1919, according to Gitelman, were the first of a subsequent wave of pogroms in which between 30,000 and 70,000 Jews were massacred across Ukraine. Of all the pogroms accounted for in Gergel's research, about 40 percent were perpetrated by the Ukrainian People's Republic forces led by Symon Petliura, 25 percent by the Ukrainian Green Army and various Ukrainian nationalist gangs, 17 percent by the White Army, especially the forces of Anton Denikin. A further 8.5 percent of Gergel's total was attributed to pogroms carried out by men of the Red Army – although these pogroms were not sanctioned by the Bolshevik leadership; the high command disarmed the regiments which had perpetrated pogroms. The Ukrainian People's Republic of Symon Petliura did also issue orders condemning pogroms, but it lacked authority to intervene. After May 1919 the Directory lost its role as a credible governing body; almost 75 percent of pogroms occurred between May and September of that year. Gergel's overall figures, which are generally considered conservative, are based on the testimony of witnesses and newspaper reports collected by the Mizrakh-yidish historiche arkhiv, which was first based in Kiev, then Berlin and later New York. The English version of Gergel's article was published in 1951 in the YIVO Annual of Jewish Social Science titled "The Pogroms in the Ukraine in 1918–1921"
In the early 20th century the pogroms broke out elsewhere in the world as well. In 1904 in Ireland, the Limerick boycott caused several Jewish families to leave the town. During the 1911 Tredegar riot in Wales, Jewish homes and businesses were looted and burned over the period of a week, before the British army was called in by then-Home Secretary Winston Churchill, who described the riot as a "pogrom". In 1919, in the Americas, there was a pogrom in Argentina, during the Tragic Week. In the aftermath of the First World War, during the localized armed conflicts of independence, 72 Jews were killed and 443 injured in the 1918 Lwów pogrom. The following year, pogroms were reported by the New-York Tribune in several cities in the newly reborn Poland, however, the reports were not only exaggerated, but also manufactured by the German legation in Warsaw, quietly opposed to the rebirth of Poland after a century of imperial partitions. The German reports were delivered to Zionist headquarters and the foreign press elsewhere by the official services of the Wihelmstrasse. Meanwhile, in the Mandatory Palestine under British administration, the Jews have been targeted in the 1929 Hebron massacre and the 1929 Safed pogrom. During World War II, the Nazi German death squads encouraged pogroms by local populations. Brand new battalions of Volksdeutscher Selbstschutz (trained by the SD agents) were mobilized from among the German minorities, in order to make the local populations share responsibility for the killings. During Operation Barbarossa against the Soviet forces in Eastern Europe Reichsführer-SS Heinrich Himmler established the Schutzmannschaft collaborationist auxiliary battalions tasked with carrying out pogroms behind the front lines. A large number of pogroms occurred during the Holocaust at the hands of non-Germans. Perhaps the deadliest of these Holocaust-era pogroms was the Iași pogrom in Romania, in which as many as 13,266 Jews were killed by Romanian citizens, police, and military officials. In June–July, 1941, encouraged by the Einsatzgruppen in the city of Lviv – location of the Lwów Ghetto – the Ukrainian People's Militia soon reorganized as the Ukrainian Auxiliary Police perpetrated two city-wide pogroms, in which around 6,000 Polish Jews were murdered, in retribution for alleged collaboration with the Soviet NKVD; the controversy surrounding the Lviv pogroms of 1941 is still debated today. On 12 October 1941 in Stanisławów, some 10,000–12,000 Jewish men, women, and children were shot at the Jewish cemetery by the Germans and the Ukrainian Auxiliary Police during the so-called "Bloody Sunday" (de). The shooters began firing at 12 noon and continued without stopping by taking turns. It was the single largest massacre of Jews in General Government prior to mass gassings of Aktion Reinhard. The term is also used in reference to attacks on non-Jewish ethnic minorities, and accordingly some scholars do not include antisemitism as a defining characteristic of pogrom. Reviewing its uses in scholarly literature, historian Werner Bergmann proposes that pogroms should be "defined as a unilateral, nongovernmental form of collective violence initiated by the majority population against a largely defenseless ethnic group, and he states that pogroms occur when the majority expects the state to provide them with no assistance in overcoming a (perceived) threat from the minority," but he adds that in western usage, the word's "anti-Semitic overtones" have been retained. Historian David Engel supports this, writing that "there can be no logically or empirically compelling grounds for declaring that some particular episode does or does not merit the label [pogrom]," but he states that the majority of the incidents "habitually" described as pogroms took place in societies significantly divided by ethnicity and/or religion where the violence was committed by the higher-ranking group against a stereotyped lower-ranking group against whom they expressed some complaint, and with the belief that the law of the land would not be used to stop them. There is no universally accepted set of characteristics which define the term pogrom. Klier writes that "when applied indiscriminately to events in Eastern Europe, the term can be misleading, the more so when it implies that 'pogroms' were regular events in the region and that they always shared common features." Use of the term to refer to events in 1918–19 in Polish cities including Kielce, Pinsk and Lwów was specifically avoided in the 1919 Morgenthau Report (preferring "excesses"), whose authors argued that the term pogrom was inapplicable to the conditions existing in a war zone and required the situation to be antisemitic in nature rather than political, and media use of the term pogrom to refer to the 1991 Crown Heights riot caused public controversy. In 2008, two separate attacks in the West Bank by Israeli Jewish settlers on Palestinian Arabs were characterized as pogroms by then Prime Minister of Israel, Ehud Olmert. Werner Bergmann suggests a particular unifying character for all such incidents: "[b]y the collective attribution of a threat, the pogrom differs from other forms of violence, such as lynchings, which are directed at individual members of a minority group, while the imbalance of power in favor of the rioters distinguishes pogroms from other forms of riot (food riots, race riots, or 'communal riots' between evenly matched groups), and again, the low level of organization separates them from vigilantism, terrorism, massacre and genocide". 38 CE Alexandrian pogrom (name disputed)[lower-alpha 1] Alexandrian riots Aulus Avilius Flaccus, the Egyptian prefect of Alexandria appointed by Tiberius in 32 CE, may have encouraged the outbreak of violence; Philo wrote that Flaccus was later arrested and eventually executed for his part in this event. Scholarly research around the subject has been divided on certain points, including whether the Alexandrian Jews fought to keep their citizenship or to acquire it, whether they evaded the payment of the poll-tax or prevented any attempts to impose it on them, and whether they were safeguarding their identity against the Greeks or against the Egyptians. 1096 1096 pogroms Rhineland massacres 2,000 Jews Peasant crusaders from France and Germany during the Popular Crusade, led by Peter the Hermit (and not sanctioned by the hierarchy of the Catholic Church), attacked Jewish communities in the three towns of Speyer, Worms and Mainz. They were the first Christian pogroms to be officially recorded. 1918 Lwów pogrom (name disputed)[lower-alpha 6] Lemberg massacre 52–150 Jews, 270 Ukrainians During the Polish-Ukrainian War over three days of unrest in the city, an estimated 52–150 Jewish residents were killed and hundreds injured, with widespread looting carried out by Polish soldiers, as well as lawless civilians, and local criminals. Two hundred and seventy more Ukrainians were killed during this time as well. The Poles did not stop the pogrom until two days after it began. The independent investigations by the British and American missions in Poland stated that there were no clear conclusions and that foreign press reports were exaggerated. 1936 Przytyk pogrom (name disputed)[lower-alpha 9] Przytyk riot 2 Jews and 1 Polish Some of the Jewish residents gathered in the town square in anticipation of the attack by the peasants, but nothing happened on that day. Two days later, however, on a market day, as Jewish historians Martin Gilbert and David Vital claim, peasants attacked their Jewish neighbors. 1977 1977 anti-Tamil pogrom 1977 anti-Tamil pogrom 300-1500 Primarily Tamils The 1977 anti-Tamil pogrom followed the 1977 general elections in Sri Lanka where the Sri Lankan Tamil nationalistic Tamil United Liberation Front won a plurality of minority Sri Lankan Tamil votes in which it stood for secession. 1991 Crown Heights pogrom (disputed)[lower-alpha 10] Crown Heights riot 1 Jew and 1 non-Jew A three-day riot that occurred in the Crown Heights section of Brooklyn, New York. The riots incited by the death of the seven-year-old Gavin Cato, unleashed simmering tensions of the Crown Heights' black community against the Orthodox Jewish community. In its wake, several Jews were seriously injured; one Orthodox Jewish man, Yankel Rosenbaum, was killed; and a non-Jewish man, allegedly mistaken by rioters for a Jew, was killed by a group of African-American men. ↑ Prof. Sandra Gambetti: "A final note on the use of terminology related to anti-Semitism. Scholars have frequently labeled the Alexandrian events of 38 C.E. as the first pogrom in history and have often explained them in terms of an ante litteram explosion of anti-Semitism. This work [The Alexandrian Riots] deliberately avoids any words or expressions that in any way connect, explicitly or implicitly, the Alexandrian events of 38 C.E. to later events in modern or contemporary Jewish experience, for which that terminology was created. ... To decide whether a word like pogrom, for example, is an appropriate term to describe the events that are studied here, requires a comparative re-discussion of two historical frames—the Alexandria of 38 C.E. and the Russia of the end of the nineteenth century." ↑ John Klier: "upon the death of the Grand Prince of Kiev Sviatopolk, rioting broke out in Kiev against his agents and the town administration. The disorders were not specifically directed against Jews and are best characterised as a social revolution. This has not prevented historians of medieval Russia from describing them as a pogrom." ↑ John Klier: "Russian armies led by Tsar Ivan IV captured the Polish city of Polotsk. The Tsar ordered drowned in the river Dvina all Jews who refused to covert to Orthodox Christianity. This episode certainly demonstrates the overt religious hostility towards the Jews which was very much a part of Muscovite culture, but its conversionary aspects were entirely absent from modern pogroms. Nor were the Jews the only heterodox religious group singled out for the tender mercies of Muscovite religious fanaticism." ↑ Israeli ambassador to Ireland, Boaz Moda'i: "I think it is a bit over-portrayed, meaning that, usually if you look up the word pogrom it is used in relation to slaughter and being killed. This is what happened in many other places in Europe, but that is not what happened here. There was a kind of boycott against Jewish merchandise for a while but that’s not a pogrom." ↑ William Rubinstein: "London-based sources, especially the press, Jewish and non-Jewish, consistently exaggerated the resemblance of the Welsh riots to Russian 'pogroms'. ... The Western Mail's 'London Letter' pointed this out on 28 August 1911, when it stated that 'both the Government and the Jewish leaders think that the Jewish press is betraying an unnecssary amount of alarm, and that it would have been better advised to have treated the attacks upon Jews and their property in Wales as part of a general attack upon persons and property'. Perhaps the most cogent letter on this subject came from Bertam Jacobs, a Welsh-born London barrister who wrote to the South Wales Argus. ... Jacobs pointed out the absurdity of likening the South Wales riots to the Russian pogroms, noting the crucial differences between the two, especially the fact that no Jew was physically assautled, no private house belonging to a Jew was set up, no anti-Semitic cries or slogans were heard, and, especially, no synagogue was attacked." ↑ David Engel: "the repeated protests of some scholars that what happened in Lwów in November 1918 was not, strictly speaking, a "pogrom""
↑ Carole Fink: "What happen in Pinsk on April 5, 1919 was not literally a "pogrom" – an organized, officially tolerated or inspired massacre of a minority such as has occurred in Lemberg – but rather a miliary execution of a small, suspect group of civilians. ... The misnamed "Pinsk pogrom", a plain, powerful, alliterative phrase, entered history in April 1919. Its importance lay not only in its timing, during the tensest moments of the Paris Peace Conference and the most crucial deliberations over Poland's political future: The reports of Pinsk once more demonstrated the swift transmission of local violence to world notice and the disfiguring process of rumor and prejudice on every level." ↑ Norman Davies: "Press reports in the West of 'Pogroms in Poland', though accepted by Jewish commentators, were repeatedly discredited by the investigations of independent British and American observers....the pogroms in Wilno in April 1919 and again in October 1920 were occasioned by the Red Army's hasty retreats, and by military reprisals against suspected collaborators." ↑ David Engel: "similar claims [that] the killing of two Jews and one Pole in the townlet of Przytyk in March 1936 [was not, strictly speaking, a "pogrom"], which became the subject of a similar bit of semantic legerdemain and ongoing argument in Poland and beyond in 2001"
↑ Media use of the term pogrom to refer to the 1991 Crown Heights riot caused public controversy. For example Joyce Purnick of The New York Times wrote in 1993 that usage of the word pogrom was "inflammatory"; she accused politicians of "trying to enlarge and twist the word" in order to "pander for Jewish voters". 1 2 "Pogrom", Encyclopædia Britannica. "pogrom, (Russian: "devastation," or "riot"), a mob attack, either approved or condoned by authorities, against the persons and property of a religious, racial, or national minority. The term is usually applied to attacks on Jews in the Russian Empire in the late 19th and early 20th centuries." 1 2 "The Wiley-Blackwell Dictionary of Modern European History Since 1789". Retrieved 15 February 2015. 1 2 3 John Klier (2011). Russians, Jews, and the Pogroms of 1881–1882. Cambridge University Press. p. 58. "By the twentieth century, the word "pogrom" had become a generic term in English for all forms of collective violence directed against Jews. The term was especially associated with Eastern Europe and the Russian Empire, the scene of the most serious outbreaks of anti-Jewish violence before the Holocaust. Yet when applied indiscriminately to events in Eastern Europe, the term can be misleading, the more so when it implies that "pogroms" were regular events in the region and that they always shared common features. In fact, outbreaks of mass violence against Jews were extraordinary events, not a regular feature of East European life." 1 2 3 4 Anti-Jewish Violence. Rethinking the Pogrom in East European History. Edited by Jonathan Dekel-Chen, David Gaunt, Natan M. Meir, and Israel Bartal "No doubt many will contend that history suggests the need for a serious attempt to clarify what a pogrom is or is not. In the event, however, no such clarification is possible, for "pogrom" is not a pre-existing natural category but an abstraction created by human beings in order to divide complex and infinitely varies social phenomena into manageable units of analysis. As a result, in the absence of universal agreement concerning the specific behaviours to which the word refers or of some supreme authority to whom the power of definition has been delegated, there can be no logically or empirically compelling grounds for declaring that some particular episode does or does not merit the label. "Engel states that although there are no "essential defining characteristics of a pogrom", the majority of the incidents "habitually" described as pogroms "took place in divided societies in which ethnicity or religion (or both) served as significant definers of both social boundaries and social rank, ... involved collective violent applications of force by members of what perpetrators believed to be a higher-ranking ethnic or religious group against members of what they considered a lower-ranking or subaltern group, ... appliers of the decisive force tended to interpret the behaviour of victims according to stereotypes commonly applied to the groups to which they belonged, ... perpetrators expressed some complaint about the victims' group, ... [and] a fundamental lack of confidence on the part of those who purveyed decisive violence in the adequacy of the impersonal rule of law to deliver true justice in the event of a heinous wrong." 1 2 A prayer for the government: Ukrainians and Jews in revolutionary times, 1917–1920, Henry Abramson "The etymological roots of the term pogrom are unclear, although it seems to be derived from the Slavic word for "thunder(bolt)" (Russian: grom, Ukrainian: hrim). The first syllable, po-, is a prefix indicating "means" or "target". The word therefore seems to imply a sudden burst of energy (thunderbolt) directed at a specific target. A pogrom is generally thought of as a cross between a popular riot and a military atrocity, where an unarmed civilian, often urban, population is attacked by either an army unit or peasants from surrounding villages, or a combination of the two. Early instances of this phenomenon in the Russian Empire were described using various terms (here in Russian): demonstratsii, gonenie, draky, besporiadki (demonstrations, persecution, fights, riots). Pogrom, however, has been the most effective in entering European languages, perhaps through Yiddish usage. Jews have not been the only group to suffer under this phenomenon, but historically Jews have been frequent victims of such violence. In mainstream usage, the word has come to imply an act of antisemitism." ↑ Oxford English Dictionary, Dec. 2007 revision. See also: Pogrom at Online Etymology Dictionary. 1 2 International handbook of violence research, Volume 1 (Springer, 2005) "The word "pogrom" (from the Russian, meaning storm or devastation) has a relatively short history. Its international currency dates back to the anti-Semitic excesses in Tsarist Russia during the years 1881–1883, but the phenomenon existed in the same form at a much earlier date and was by no means confined to Russia. As John D. Klier points out in his seminal article "The pogrom paradigm in Russian history", the anti-Semitic pogroms in Russia were described by contemporaries as demonstrations, persecution, or struggle, and the government made use of the term besporiadok (unrest, riot) to emphasize the breach of public order. Then, during the twentieth century, the term began to develop along two separate lines. In the Soviet Union, the word lost its anti-Semitic connotation and came to be used for reactionary forms of political unrest and, from 1989, for outbreaks of interethnic violence; while in the West, the anti-Semitic overtones were retained and government orchestration or acquiescence was emphasized." ↑ Amos Elon (2002), The Pity of It All: A History of the Jews in Germany, 1743–1933. Metropolitan Books. ISBN 0-8050-5964-4. p. 103. ↑ Anna Foa The Jews of Europe after the black death 2000 p. 13 "The first massacres took place in April 1348 in Toulon, where the Jewish quarter was raided and forty Jews were murdered in their homes. Shortly afterward, violence broke out in Barcelona." ↑ Codex Judaica: chronological index of Jewish history; p. 203 Máttis Kantor - 2005 "The Jews were savagely attacked and massacred, by sometimes hysterical mobs." ↑ Herman Rosenthal (1901). "Chmielnicki, Bogdan Zinovi". Jewish Encyclopedia. Also in: Anna Reid (2000). Borderland: A Journey Through the History of Ukraine. Westview Press. p. 35. ISBN 0-8133-3792-5. David Theo Goldberg, John Solomos (2002). A Companion to Racial and Ethnic Studies, Blackwell Publishing, ISBN 0-631-20616-7, p. 68. Michael Clodfelter (2002). Warfare and Armed Conflicts: A Statistical Reference to Casualty and Other Figures, 1500–1999, McFarland & Co Inc, p. 56: estimated at 56,000 dead. Oscar Reiss (2004). The Jews in Colonial America, McFarland & Company, ISBN 0-7864-1730-7, pp. 98–99. Samuel Totten (2004). Teaching About Genocide: Issues, Approaches, and Resources, Information Age Publishing, ISBN 1-59311-074-X, p. 25. Meyer Waxman (2003). History of Jewish Literature Part 3, Kessinger Publishing, ISBN 0-7661-4370-8, p. 20: estimated at about two hundred thousand Jews killed. Michael Clodfelter (2002). Warfare and Armed Conflicts: A Statistical Reference to Casualty and Other Figures, 1500–1999, McFarland & Co Inc, p. 56: estimated at between 150,000 and 200,000 Jewish victims. The Columbia Encyclopedia (2001–2005), "Chmielnicki Bohdan", Sixth Edition: estimated at over 100,000 Jews. Robert Melvin Spector (2005). World Without Civilization: Mass Murder and the Holocaust, History, and Analysis, University Press of America, ISBN 0-7618-2963-6, p. 77: estimated at more than 100,000. Sol Scharfstein (2004). Jewish History and You, KTAV Publishing House, ISBN 0-88125-806-7, p. 42: estimated at more than 100,000 Jews killed. ↑ Davies, Norman (2005). "Rossiya: The Russian Partition (1772–1918)". God's Playground: a history of Poland. Oxford: Clarendon Press. p. 60–61. ISBN 0199253404. Volume II: Revised Edition. ↑ Encyclopaedia Judaica. "Shtetl". Jewish Virtual Library, The Gale Group. Also in: Rabbi Ken Spiro. "Pale of Settlement". History Crash Course #56. Aish.com. ↑ John Doyle Klier, Shlomo Lambroza (2004). Pogroms: Anti-Jewish Violence in Modern Russian History. Cambridge University Press. p. 376. ISBN 0521528518. CS1 maint: Uses authors parameter (link) Also in: Omer Bartov (2013). Shatterzone of Empires. p. 97. Note 45. It should be remembered that for all the violence and property damage caused by the 1881 pogroms, the number of deaths could be counted on one hand. Further information: Oleg Budnitskii (2012). Russian Jews Between the Reds and the Whites, 1917-1920. University of Pennsylvania Press. pp. 17–20. ISBN 0812208145. ↑ Heinz-Dietrich Löwe, Pogroms in Russia: Explanations, Comparisons, Suggestions, Jewish Social Studies , New Series, Vol. 11, No. 1 (Autumn, 2004) , pp. 17–. Excerpt. ↑ Henry Abramson (10–13 July 2002). "The end of intimate insularity: new narratives of Jewish history in the post-Soviet era" (PDF). Acts. Sapporo, Japan: Symposium “Construction and Deconstruction of National Histories in Slavic Eurasia”. ↑ Shlomo Lambroza (1993). Herbert A. Strauss, ed. Jewish self-defence. Current Research on Anti-Semitism: Hostages of Modernization. Walter de Gruyter. pp. 1256, 1244–45. ISBN 3110137151. ↑ Colin Tatz (2016). The Magnitude of Genocide. Winton Higgins. ABC-CLIO. p. 26. ISBN 1440831610. ↑ Gitelman (2001). Revolution and the Ambiguities. p. 25. Chapter 2. 1 2 Nora Levin (1991). The Jews in the Soviet Union Since 1917: Paradox of Survival. NYU Press. p. 43. ISBN 0-8147-5051-6, ISBN 978-0-8147-5051-3. ↑ Zvi Y. Gitelman (2001). A Century of Ambivalence: The Jews of Russia and the Soviet Union, 1881 to the Present. Indiana University Press. pp. 65–70. ISBN 0253338115. ↑ Sharman Kadish. Bolsheviks and British Jews: The Anglo-Jewish Community, Britain, and the Russian Revolution. Routledge. p. 87. ↑ Encyclopaedia Judaica (2008). "Pogroms". The Jewish Virtual Library. 1 2 Serhy Yekelchyk (2007). Ukraine: Birth of a Modern Nation. Oxford University Press. p. 106. ISBN 978-0-19-530546-3. ↑ Paul Robert Magocsi (2010). History of Ukraine - The Land and Its Peoples. University of Toronto Press. p. 537. ISBN 1-4426-4085-5. ↑ Ivan Bunin (1998), Cursed Days: A Diary of Revolution. May 2/15, 1919. Ivan R. Dee, ISBN 1461730309. Page 141. ↑ Neil Prior. "History debate over anti-Semitism in 1911 Tredegar riot". BBC News, 19 August 2011. ↑ "Tragic Week Summary". BookRags.com. 2010-11-02. Retrieved 2011-10-24. ↑ Joanna B. Michlic (2006). Poland's Threatening Other: The Image of the Jew from 1880 to the Present. University of Nebraska Press. p. 111. "In three days 72 Jews were murdered and 443 others injured. The chief perpetrators of these murders were soldiers and officers of the so-called Blue Army, set up in France in 1917 by General Jozef Haller (1893–1960) and lawless civilians". ↑ Herbert Arthur Strauss (1993). Hostages of Modernization: Studies on Modern Antisemitism, 1870–1933/39. Walter de Gruyter. p. 1048. ↑ Marsha L. Rozenblit (2001). Reconstructing a National Identity: The Jews of Habsburg Austria During World War I. Oxford University Press. p. 137. "The largest pogrom occurred in Lemberg [= Lwow]. Polish soldiers led an attack on the Jewish quarter of the city on November 21–23, 1918 that claimed 73 Jewish lives". ↑ Zvi Y. Gitelman (2003). The Emergence of Modern Jewish Politics: Bundism and Zionism in Eastern Europe. University of Pittsburgh Press. p. 58. "In November 1918, Polish soldiers who had taken Lwow (Lviv) from the Ukrainians killed more than seventy Jews in a pogrom there, burning synagogues, destroying Jewish property, and leaving hundreds of Jewish families homeless." ↑ Tobenkin, Elias (1919-06-01). "Jewish Poland and its Red Reign of Terror". New York Tribune. Retrieved 2010-08-29. ↑ Neal Pease (2003). M.B.B. Biskupski, ed. This Troublesome Question: The United States and the "Polish Pogroms" of 1918–1919. Ideology, Politics and Diplomacy in East Central Europe. University of Rochester Press. Also in: Carole Fink (2006). Defending the Rights of Others: The Great Powers, the Jews, and International Minority Protection, 1878-1938. Cambridge University Press. p. 112. ISBN 0521029945. See: Wihelmstrasse. As well as: Peter D. Stachura (1998). Poland between the Wars, 1918–1939. Springer. p. 36. ISBN 1349269425. ↑ "World War II: Before the War", The Atlantic, June 19, 2011. "Windows of shops owned by Jews which were broken during a coordinated anti-Jewish demonstration in Berlin, known as Kristallnacht, on Nov. 10, 1938. Nazi authorities turned a blind eye as SA stormtroopers and civilians destroyed storefronts with hammers, leaving the streets covered in pieces of smashed windows. Ninety-one Jews were killed, and 30,000 Jewish men were taken to concentration camps. ↑ Michael Berenbaum, Arnold Kramer (2005). The World Must Know. United States Holocaust Memorial Museum. p. 49. ↑ Gilbert, Martin (1986). The Holocaust: the Jewish tragedy. Collins. pp. 30–33. ISBN 0-00-216305-5. ↑ Dean, Martin (2003). Collaboration in the Holocaust: Crimes of the Local Police in Belorussia and Ukraine, 1941-44. Palgrave Macmillan. pp. 66–72. ISBN 9781403963710. ↑ Report of the International Commission on the Holocaust in Romania (RICHR) submitted to President Ion Iliescu in Bucharest on 11 November 2004. ↑ "The Farhud", Holocaust Encyclopedia, United States Holocaust Memorial Museum. ↑ Julia Magnet. "The terror behind Iraq's Jewish exodus", The Daily Telegraph, April 16, 2003. ↑ Holocaust Resources, History of Lviv. ↑ Löw, Andrea (10 June 2013). "Stanislawów (now Ivano-Frankivsk)". United States Holocaust Memorial Museum. Archived from the original on 20 May 2014. Retrieved 29 January 2016. From The USHMM Encyclopedia of Camps and Ghettos, 1933–1945. ↑ Pohl, Dieter. Hans Krueger and the Murder of the Jews in the Stanislawow Region (Galicia) (PDF). pp. 12–13, 17–18, 21 – via Yad Vashem.org. 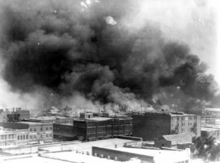 It is impossible to determine what Krueger's exact responsibility was in connection with 'Bloody Sunday' [massacre of 12 October 1941]. It is clear that a massacre of such proportions under German civil administration was virtually unprecedented. ↑ "Operation Reinhard (Einsatz Reinhard)". United States Holocaust Memorial Museum. Retrieved August 15, 2016. ↑ Tadeusz Piotrowski, Poland's Holocaust, McFarland & Company, 1997, ISBN 0-7864-0371-3, Google Print, p.164. ↑ "Holocaust Revealed". www.holocaustrevealed.org. Retrieved 2008-09-02. ↑ "Instytut PamiÄci Narodowej". Retrieved 15 February 2015. ↑ A communiqué regarding the decision to end the investigation of the murder of Polish citizens of Jewish nationality in Jedwabne on 10 July 1941 (Komunikat dot. postanowienia o umorzeniu śledztwa w sprawie zabójstwa obywateli polskich narodowości żydowskiej w Jedwabnem w dniu 10 lipca 1941 r.) from 30 June 2003. ↑ Contested memories By Joshua D. Zimmerman, Rutgers University Press – Publisher; pp. 67–68. ↑ Antisemitism By Richard S. Levy, ABC-CLIO – Publisher; p. 366. ↑ Alexander B. Rossino, Polish "Neighbors" and German Invaders: Contextualizing Anti-Jewish Violence in the Białystok District during the Opening Weeks of Operation Barbarossa, Polin: Studies in Polish Jewry, Volume 16 (2003). ↑ Jan Tomasz Gross, "Neighbors: The Destruction of the Jewish Community in Jedwabne, Poland", Penguin Books, Princeton University Press, 2002. ↑ Bostom, Andrew G. (Ed.) 2007. The Legacy of Islamic Antisemitism: From Sacred Texts to Solemn History. ↑ "Sunshine, Blossoms and Blood". Retrieved 15 February 2015. ↑ "Easter in Kishinev". Retrieved 15 February 2015. ↑ "Reading Ferguson: books on race, police, protest and U.S. history". Retrieved 30 July 2016. ↑ Bergmann writes that "the concept of "ethnic violence" covers a range of heterogeneous phenomena, and in many cases there are still no established theoretical and conceptual distinctions in the field (Waldmann, 1995:343)" Bergmann then goes on to set out a variety of conflicting scholarly views on the definition and usage of the term pogrom. 1 2 "Poland's Holocaust". Retrieved 15 February 2015. ↑ "What The 'Pogrom' Wrought - The Jewish Week". The Jewish Week. Retrieved 15 February 2015. ↑ "New York Magazine". Retrieved 15 February 2015. ↑ "BBC NEWS - Middle East - Olmert condemns settler 'pogrom'". Retrieved 15 February 2015. ↑ Prof. Sandra Gambetti (2009). The Alexandrian Riots of 38 C.E. and the Persecution of the Jews: A Historical Reconstruction. University of California, Berkeley: BRILL. pp. 11–12. ISBN 9004138463. ↑ Klier also writes that Alexander Pereswetoff-Morath has advanced a strong argument against considering the Kiev riots of 1113 an anti-Jewish pogrom. Pereswetoff-Morath writes in "A Grin without a Cat" (2002) that "I feel that Birnbaum's use of the term "anti-Semitism" as well as, for example, his use of "pogrom" in references to medieval Rus are not warranted by the evidence he presents. He is, of course, aware that it may be controversial." ↑ "Portugal". Source: Encyclopaedia Judaica. ↑ "Welsh Journals Online -". Retrieved 15 February 2015. ↑ "Controversy and Crisis". Retrieved 15 February 2015. 1 2 Anti-Jewish Violence. Rethinking the Pogrom in East European History. Edited by Jonathan Dekel-Chen, David Gaunt, Natan M. Meir, and Israel Bartal "the repeated protests of some scholars that what happened in Lwów in November 1918 was not, strictly speaking, a "pogrom"— or similar claims about the killing of two Jews and one Pole in the townlet of Przytyk in March 1936, which became the subject of a similar bit of semantic legerdemain and ongoing argument in Poland and beyond in 2001"
1 2 3 In God's Playground, Volume II, p192, Norman Davies writes in relation to events in Lviv (1918), Pinsk (1919) and Vilnius (1919-20): "Press reports in the West of 'Pogroms in Poland', though accepted by Jewish commentators, were repeatedly discredited by the investigations of independent British and American observers. The so-called pogrom in Lwów, in November 1918, turned out to be a military massacre where three times more Christians died than Jews. The so-called pogrom in Pinsk in March 1919 turned out to be work of a panicky lieutenant, whose order to executre thirty-five suspected Bolshevik infiltrators was described by a US investigator as 'fully justified by the circumstances'; the pogroms in Wilno in April 1919 and again in October 1920 were occasioned by the Red Army's hasty retreats, and by military reprisals against suspected collaborators." ↑ Steven K. Baum, Shimon Samuels. Antisemitism Explained. University Press of America. 2011. p. 174. ↑ "Istanbul love story". The Post and Courier. April 10, 2011. ↑ The Jewish Week, August 9, 2011 "A divisive debate over the meaning of pogrom, lasting for more than two years, could have easily been ended if the mayor simply said to the victims of Crown Heights, yes, I understand why you experienced it as a pogrom." ↑ Purnick, Joyce (June 3, 1993). "Editorial Notebook: Crown Heights Was Not Iasi". The New York Times. ↑ "TIMELINE: How the 1991 Crown Heights riots unfolded". New York Daily News. Retrieved 25 October 2014. ↑ Okeowo, Alexis (August 19, 2011). "Crown Heights, Twenty Years After the Riots". The New Yorker. Giuliani called the riots a pogrom. ↑ "Buddhists from Bangladesh resettle in Myanmar, Rohingya Muslims cry foul". Csmonitor.com. May 24, 2013. Horvitz, Leslie A.; Catherwood, Christopher, eds. (2006). Encyclopedia of War Crimes and Genocide. New York, NY: Facts on File. ISBN 0-8160-6001-0. Shelton, Dinah, ed. (2005). Encyclopedia of Genocide and Crimes against Humanity. Detroit: Macmillan Reference. ISBN 0-02-865847-7. Thackrah, John R., ed. (1987). Encyclopedia of Terrorism and Political Violence. London: Routledge & Kegan Paul. ISBN 0-7102-0659-3.